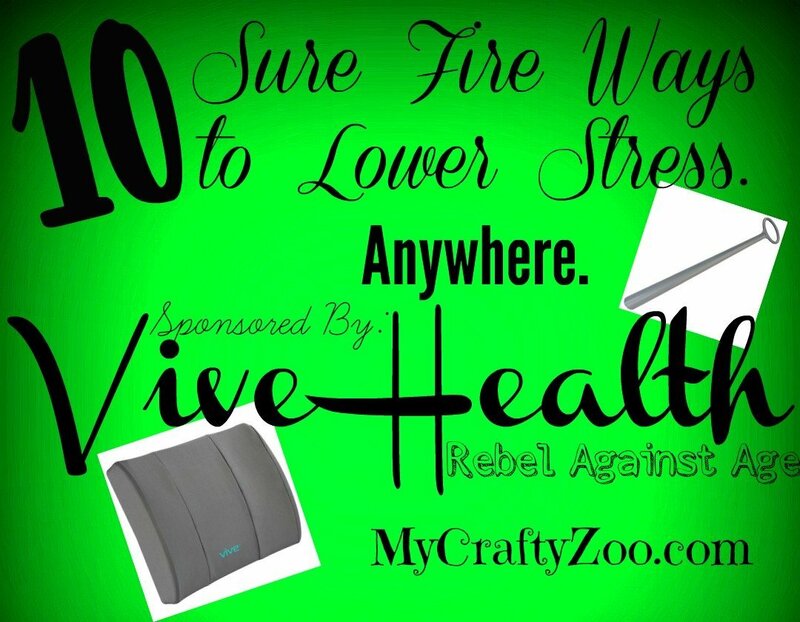 10 Sure Fire Ways to Lower Stress. Anywhere. Stress is everywhere and makes life harder than it already is. Check out these 10 ways to help reduce stress and have a better day! Sitting in an office all day, or even just part of the day, can be very taxing on one’s back. The way we sit, the repetitive motions, and so many other issues can cause that pain. This pain will cause so many other issues, not just the nuisance of a back ache. It can also hinder your sleep, which effects your overall health and wellness. In addition, according to Psychology Today, chronic pain actually alters the how our brain works; it can cause “impaired attention, short-term memory, judgement and social skills”. Add that up with work and life stress, and it can become overwhelming quickly. I had heard these things and many more, as I’m sure you have, but never gave them much thought. I decided to try out Vive Lumbar Support and as SOON as I placed it behind me, I could tell a difference. Not only was my back immediately ‘happier’, my posture improved and I was immensely more comfortable! I can officially say I am convinced. If for no other reasons than the amazing feeling of being so comfortable and the relief I feel on my spine. My only disappointment is that the sturdy strap it has doesn’t fit around my big fat chair. I’m overcoming that obstacle, as all I have to do is place it where I want it and go to work, I don’t move that much while working (also a cause of back pain, lol). If you’ve already done your back in, as I did in my very early 20’s, don’t despair. 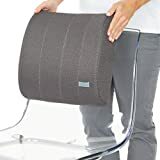 The lumbar support will actually probably benefit you more immediately than it anyone as you know exactly which are pressures from your back. I’m telling you, whether you spend one hour or 8 in any kind of chair, you want, no, NEED the Vive Lumbar Support! Initially it takes a few minutes to get use to it being there, but once you adjust it’s comfortable. The magic is when you stand up. Whether you’ve sat for a half hour or for a few, you’ll notice the wonderful difference when you stand! 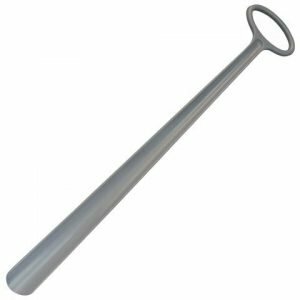 For those days when the pain is just too much or you just don’t want that one extra bend, you should definitely check out the Long shoe horn! It enables you to put on your shoes without bending to fix the back of your shoe. I don’t know why this isn’t on the must have pregnancy list! I know that myself and many of my friends would have been ecstatic to have this! As a matter of fact, if you know a pregnant woman, buy her this. Don’t ask, just wait til she starts the inevitable wobble and deliver it to her before she has a chance to get her shoes on one morning. She’ll love it! For a measly $12.95 you can ensure the life of the heel of your shoe without having to do that painful bending, twisting and stretching. Even if you haven’t had a back injury, we all know there are days where we don’t feel like it or literally are unable to do so, and this quick and easy tool makes life a little easier! 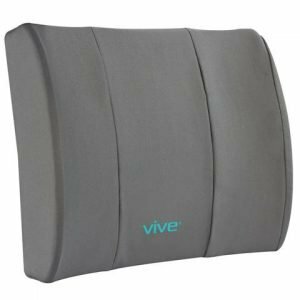 Vive Health has so many products that help make life simpler and more bearable. They are an Accredited Business by the BBB for Medical Supplies. Even if you don’t have any health issues at the moment (which is fabulous), they have things that will make your life a little more comfortable and help to prevent so many could be ailments. In addition to the various supports and living aids, they have mobility products and even awesome insoles, which I suspect by the reviews would do much more than the ones we pick up at local mass retailers! Now, in homage to the Vive Health motto: Rebel Against Aging, here is a list of ways to help you do so by reducing stress, they are mostly office focused but to be honest, they can successfully be applied to reduce stress in any area of your life! Work or not! 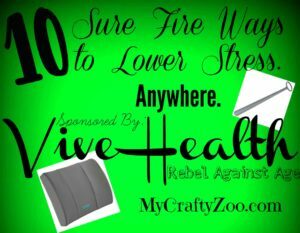 10 Sure Fire Ways to Reduce Stress. Anywhere. Get up every now and then and do a few exercises. This has 3 benefits: it will wake you up, burn a few calories AND you’ll help reduce the aches and pains caused by repetitive work. You can stand by your desk and squat to get into the drawer rather than just reach down, take the long way to the bathroom or break room. Let it Out in a HEALTHY way! Talking about it after work will only bring the stress and tension back to you, talking about it to co-workers will make you look bad and can create all kinds of drama (whether immediate or down the road) but keeping it in is bad too. Get a notebook (do NOT do it on a work computer, for crying out loud!) and write down what you are stressed about, make a note or two about how it can be improved and remind yourself that you will get through it. Can you think of something worse that you have been through where you felt these same feelings? Always nice to have a reminder that this, too, shall pass! In the midst of the fire, stop and take a deep breathe before you react. Nothing is going to get worse in that 3 minutes of breathing, but things could certainly get worse if your panic reaction is not the right decision. You want to be logical, when in a panic it can take up to 20 minutes before our heartbeat slows down and we can begin to think logically. You got this. Can’t focus? I am the world’s worst about not being able to focus. I have a hundred other things going on a perpetual to do list in my head. I’ve learned to cope with that by starting a list on paper, if a ‘to do’ pops in my head, I write it down and get back to work. It works wonders to get things out of my head so that I can focus on what is important. Adjust your environment. Feng Shui and many other studies talk about how having a cluttered space will cause additional stress. Who needs that? Organize your space, find a system that works for you. They also suggest adding a plant if possible to give your eyes a break from time to time and add an additional tension reducer. If possible, play soft music in the background. Classical is fantastic for helping with concentration! Know Your Weaknesses. If you know what areas are challenging for you, you can identify them and find strategies to overcome them without getting worked up about the issue. Everyone has weaknesses, those that get familiar with those weaknesses are more likely to overcome and defeat them! Don’t get involved in office gossip, drama, or whatever. Regardless of your opinion. You are at work to work. Not make friends OR enemies. Compliment someone. Try to find some way to lift someone else up at least once a day. Studies show that it helps us to release endorphins, therefore reducing our own stress. Plus, everyone loves a positive environment! Please note, this post is a sponsored post. I did receive some of the above mentioned products for free in order to facilitate this review. However, my opinions are always my own and are in no way influenced.